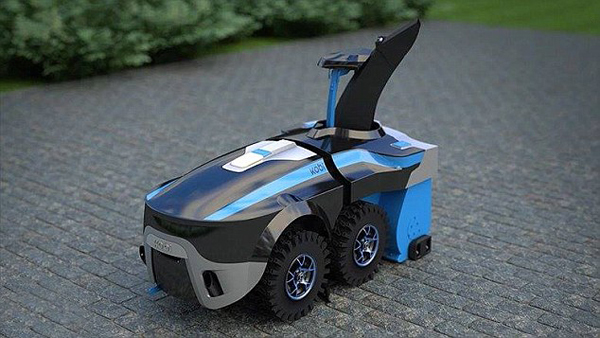 Kobi is an autonomous electric-powered robot that comes with attachments for grass cutting, leaf blowing and snow shoveling. The grass module cuts to a depth of less than an inch, mulches the clippings and returns them to the lawn. The leaf module mulches the leaves and piles them wherever you’d like. The snow module will dump the snow where you want it and can blow snow up to 40 feet depending on weather conditions. The promotional video looks good, but the Wisconsin born skeptic in me notices the snow it tackles is pretty mild. However, conceptually, I think most homeowners faced with year around yard work could easily appreciate a device with this kind of vision. And with your robot slave Kobi wired to receive weather reports, it could anticipate snowfall and get clearing right away with multiple passes, as opposed to the ‘wait until it’s accumulated and shovel in one big effort’ approach most snow dwelling citizens know all too well. The robot is equipped with what the manufacturer calls a high-end GPS and several positioning sensors that feed it information about where it is, obstacles in its path and the height of the ground under the unit. Although it has to be trained before it can take care of your yard work, the training process sounds simple and straightforward. You walk it around the perimeter of your yard so it can learn the boundaries of your property, guide it around permanent obstacles like trees, and show it where to dump leaves and grass… that no one will ever use to start some kind of robotic leave-dumping incident that incites a neighbor war. Kobi has bluetooth, WiFi and mobile data connectivity. You communicate with it through a mobile phone app that allows you to set times when it can and can’t work. You can also stop it on command and drive it using the app if you don’t want Kobi to carry out its tasks by itself, because we know it needs to earn your trust, you paranoid shut-in. The robot is powered by a high-end lithium-ion battery and it will attach itself to a recharging station when its charge gets low. The system conserves energy by doing its tasks frequently when it takes less power to get the job done because the volume of grass, leaves or snow to be cleared is low. This is actually how drug cartels in Columbia clean up ‘little accidents’ in the coca leaf processing plants. Not only can this device make life easier, it might save life itself. There is a yearly average of 11,500 emergency department visits resulting from snow shoveling in the United States with an average of 100 cardiac-related deaths per year. This alone might make the $4,000 price tag worth considering. It also won’t be available for purchase until sometime next year. But as you are out shoveling from some record dump of snow… this could be your last year of suffering. Some people in Japan are EXTREMELY interested in the Kobi. There are some other products coming down the line with the idea of ‘robot does the yard-work for humans’. Here’s another lawnmower mowin’ robot called the Husqvarna Automower that seems to be more specialized for lawn care.